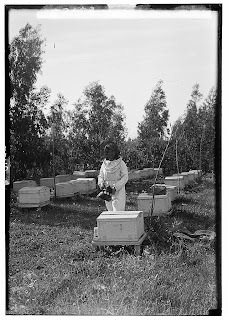 Borochov Girls Farm, bee culture. According to Jewish tradition, when the Bible describes the Land of Israel as the "land of milk and honey" it meant the sweet honey extract of dates and not the produce of honey bees. Nonetheless, Jews have adopted bees' honey for the Rosh Hashana custom of dipping apples in honey and wishing loved ones, "May you have a good and sweet year." Six agricultural training schools were established for young Jewish women in the Eretz Yisrael in the 1920s, and the American Colony photographers were frequent visitors. Here is a "sweet" photo taken at the Borochov girls school more than 80 years ago.